SAN FRANCISCO — Since late March I’ve been living in a one-room cottage behind an old Craftsman-style home in Berkeley, and commuting to downtown San Francisco. It’s not your typical daily trip. But as gas prices rise, congestion mounts, and family incomes fall, it may well become a new kind of commuting norm in the United States. Of course it may not, too. This being San Francisco. And the weather is just unbelievably good most of the year. But this is how it goes. I am a casual carpooler. Every morning I stand on line in front of the Safeway on Claremont Street, about six minutes walk from my house. Usually there are other people there, too, along with a line of cars and drivers waiting to pick up other casual commuters, two or three at a time. The goal in all of this is to save time and money for driver and passengers. Crossing the tragically congested San Francisco-Oakland Bay Bridge on a weekday morning can take over an hour because of the longest toll lines I’ve ever seen. The cost also is $4.00. But cars with three or more passengers zip through in the free carpool lanes. I save the $3.30 it would cost to ride the BART from the Rockridge Station to Embarcadero. I’ve been doing this for a few weeks now and it’s just a marvel of ingenuity, convenience, and overcoming the fear of the stranger, which has gripped our country for 40 years or so. I’ve ridden with two student artists at San Francisco State, a manager of high rise buildings in San Francisco, a graphic designer, and a developer of affordable housing. I’ve had the chance to check out a two-seat Mercedes, a brand new Volvo, a Land Rover and any number of Toyota Prius’s. Nobody, and I mean nobody, drives an American car here. One of the guys I rode with is an engineer who gave me a lead on an apartment in Oakland, which turned out to be too expensive. Another told me about a hot graphic designer, who is as good as advertised and may fit into our publication schedule at the Apollo Alliance, where I work. Drivers dispatch their passengers in San Francisco at the corner of Fremont and Howard, which is a couple of blocks from the Embarcadero along magnificent San Francisco Bay. 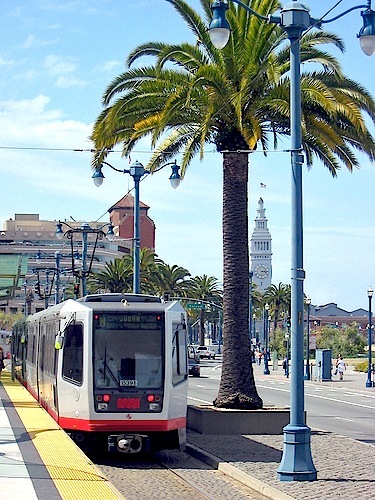 In 1991, two years after the Loma Prieta earthquake, San Francisco demolished the elevated Embarcadero Freeway, replacing it with a palm-lined boulevard. An active lightrail line now runs in the median, passing gardens and parks and thousands of new units of housing, and swanky bars, the Giants baseball stadium, and all the other centers of human commerce that blossomed in what had been the shadows of a loud, dangerous, transportation eyesore. If I walk, with the sun rising over the bay, it takes about 25 minutes. When I ride the Muni train to 4th Street, a block from my Townsend Street office, it takes about 10 minutes and costs $1.50. Total commute time: 45 minutes to an hour. Going home, I take the Muni to the Embarcadero BART station. BART takes me to the Rockridge Station, and I walk the 12 minutes up College Avenue and Claremont, stopping by the Safeway to get something for dinner. Travel cost: $4.80. Travel time: 45 minutes. Total expense saved from not having to own or drive a car: At least $1,000 a month, after taxes.